Held on the white sands of Fort Lauderdale Beach Park in a beautiful oceanside setting, Tortuga Music Festival is a 3-day, multi-stage music festival featuring some of the biggest names in country, rock and roots music. Tortuga Music Festival brings like-minded fans together for an unforgettable beach weekend experience that pairs music with meaning to raise awareness for marine conservation. Tortuga Music Festival works hand in hand with the Rock The Ocean Foundation to increase public awareness about the issues impacting the world’s oceans and to support scientific research, education, and ocean conservation initiatives. Over $300,000 has been given back to our Conservation Village partners as a direct result of ticket sales and donations from Rock The Ocean’s Tortuga Music Festival. Fort Lauderdale, FL – February 13, 2017 – After the success of their first Beach Clean-Up event, HUKA Entertainment partnering with Tito’s Handmade Vodka are scheduling two more environmental beach clean-up parties prior to the Fifth Annual Tortuga Music Festival. They will be Saturday, February 25 in Ft. Lauderdale (just adjacent to the Festival site); and Saturday, March 25 in Jupiter. At their first clean-up in Pompano Beach more than 200 pounds of garbage was collected. We encourage all our fans and their friends to come out and volunteer to make an impact on this environmental effort. Volunteers can sign-up at: http://www.tortugamusicfestival.com/beach-cleanups/. Saturday, February 25 – Ft. Lauderdale (10AM – 2PM) – Meet at Beachside of A1A and Las Olas. Again Volunteers can sign-up at: http://www.tortugamusicfestival.com/beach-cleanups/. 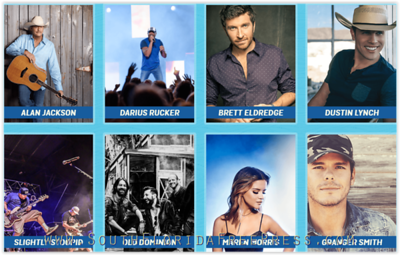 Country superstars Kenny Chesney, Luke Bryan and Chris Stapleton are headlining this year’s Rock The Ocean’s Tortuga Music Festival, highlighting what is the best line-up yet to celebrate its Fifth Year. Last year tens of thousands of fans enjoyed the endless sun, songs, sand and surf as last year’s festival, this one-of-a-kind music at the beach event, added a third day to accommodate an even bigger lineup of some of music’s hottest talent. The 2017 Tortuga Music Festival will take place Friday, April 7, Saturday, April 8 and Sunday, April 9, 2017 on the sands of Fort Lauderdale Beach Park in Fort Lauderdale, FL. Tortuga Music Festival, produced and promoted by HUKA Entertainment, features multiple stages with unparalleled VIP amenities for viewing some of the hottest and most unique artists in country, rock and roots music. Last year’s festival drew a record-breaking attendance of more than 90,000 music fans from all over the world. The event serves to celebrate HUKA’s destination location theme with the festival’s ocean-side setting while still raising awareness of issues impacting the world’s oceans and supporting marine research and conservation, as well as protection of the festival’s namesake – sea turtles that nest annually along South Florida’s Atlantic seaboard. To this date more than $300,000 has been raised to support these efforts. The onsite Conservation Village, which will again be curated by Rock The Ocean, will play host to organizations dedicated to marine research and conservation, and will provide interactive, educational experiences for festival patrons. Additionally, festivalgoers will again be encouraged to collect waste at the event site to minimize the festival’s impact on the environment, as in previous years, when fans were rewarded for their efforts with various premiums given in exchange for collected trash.